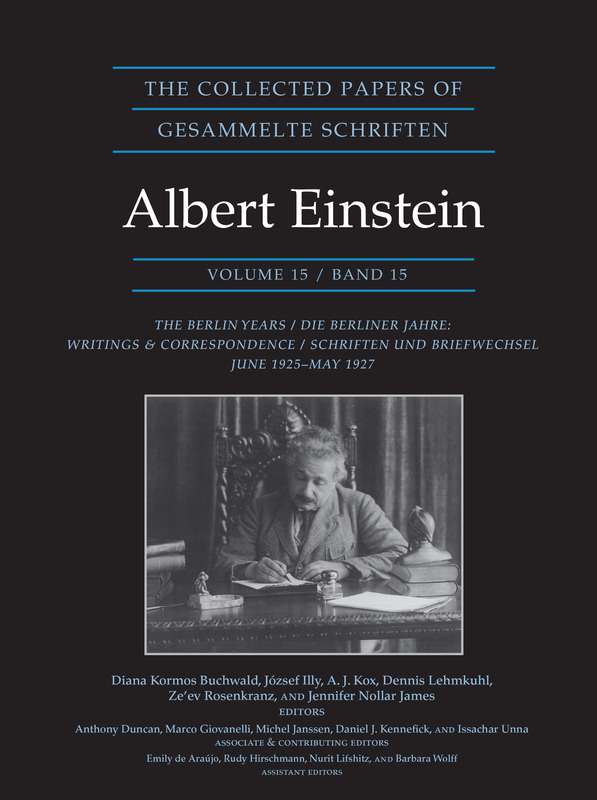 Princeton University Press, the Einstein Papers Project at the California Institute of Technology, and the Albert Einstein Archives at the Hebrew University of Jerusalem, are pleased to announce the latest volume in the authoritative Collected Papers of Albert Einstein. Volume 15: The Berlin Years: Writings & Correspondence, June 1925-May 1927, Documentary Edition covers one of the most thrilling two-year periods in twentieth-century physics, as matrix mechanics—developed chiefly by W. Heisenberg, M. Born, and P. Jordan—and wave mechanics—developed by E. Schrödinger—supplanted earlier quantum theory. The almost one hundred writings, a third of which have never before been published, and the more than thirteen hundred letters demonstrate Einstein’s immense productivity at a tumultuous time. From fraudulent science to hope for European reunification, the newest volume of The Collected Papers of Albert Einstein conveys the breakneck speed of Einstein’s personal and professional life. THE COLLECTED PAPERS OF ALBERT EINSTEIN is one of the most ambitious publishing ventures ever undertaken in the documentation of the history of science. Selected from among more than 40,000 documents contained in the personal collection of Albert Einstein (1879-1955), and 20,000 Einstein and Einstein-related documents discovered by the editors since the beginning of the Einstein Papers Project, The Collected Papers provides the first complete picture of a massive written legacy that ranges from Einstein’s first work on the special and general theories of relativity and the origins of quantum theory, to expressions of his profound concern with international cooperation and reconciliation, civil liberties, education, Zionism, pacifism, and disarmament. The series will contain over 14,000 documents as full text and will fill close to thirty volumes. Sponsored by the Hebrew University of Jerusalem and Princeton University Press, the project is located at and supported by the California Institute of Technology and has made available a monumental collection of primary material. It will continue to do so over the life of the project. The Albert Einstein Archives is located at the Hebrew University of Jerusalem. The open access digital edition of the first 15 volumes of the Collected Papers is available online at einsteinpapers.press.princeton.edu. ABOUT THE EDITORS: At the California Institute of Technology, Diana Kormos Buchwald is professor of history; A. J. Kox is senior editor and visiting associate in history; József Illy and Ze'ev Rosenkranz are editors and senior researchers in history; Dennis Lehmkuhl is research assistant professor and scientific editor; and Jennifer Nollar James is assistant editor. This volume is available in hardcover at https://press.princeton.edu/titles/11327.html.